It’s not just about the destination—it’s the journey. This is a phrase we hear often in everyday life, but it’s now being taken to heart in the world of transportation. Gone are the days of humdrum waiting rooms at airports and bus and train stations. Now, you’re entering a new world catering to a travelers’ every need, and transportation hubs are using AV to make it happen. 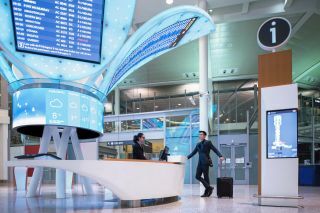 JBL’s Intellivox controls audio’s vertical directivity patterns at Singapore’s Changi Airport. One of the biggest challenges transportation hubs face is managing the user experience. Venues need to use AV to provide quick, easy access to information. How do integrators accomplish that without overwhelming weary travelers? At any given point in time, passengers want to see “the status of their itinerary, the location of amenities, or an entertaining glimpse at local culture. How do you deliver so much information to such large and mobile audiences?” mused Lloyd. A 30 x 10 foot NanoLumens LED display provides travelers at NYC’s JFK Airport with a host of information, and can be seen clearly from anywhere in the general vicinity. As an answer to this question, Lloyd pointed to Terminal Four of New York City’s John F. Kennedy International Airport, through which one out of every 12 people entering the U.S. from an inbound foreign flight passes. “The importance of communicating varied information [to arriving passengers] quickly and clearly cannot be overstated,” she said. Visual information is everywhere, but how many of you “speak conductor”? You know what we’re talking about—you’re on the subway platform and you hear an unintelligible announcement. If you’ve taken the subway long enough, you start to “speak conductor” and are able to actually understand the information being communicated. But we shouldn’t have to learn a foreign dialect just to get where we’re trying to go. Toronto Pearson International Airport showcases a flower-inspired LED designed to both inform passengers and to beautify the busy airport. He claims there are three key aspects to speech intelligibility in transportation: direct-to-reverberant ratio; signal-to-noise ratio; and distortion from the PA system. If designers pay close attention to each of the factors above, they will be able to deliver a clear and understandable message to passengers, he said. Another consideration Screen pointed out is that transportation PA systems are now being used for both public addresses and emergency announcements, which means venues have to comply with local regulations for emergency sound systems and/or voice alarm systems. Nobody wants a debacle like the May 2017 hacking of a large touchscreen display in Washington, DC’s Union Station, where visitors were exposed to more than three minutes of adult videos in the terminal during rush hour. Not only were passersby offended, but the screens remained off for several days while an investigation took place—frustrating travelers who lacked access to public service announcements, and getting in the way of valuable ad dollars for the operators. With so many AV systems relying on internet connections, what extra steps can integrators take to ensure their stuff is “hack proof”? With a combination of secure video, clear audio, and a carefully planned user experience, you can do your part to ensure a happy traveler’s journey. John Pescatore, director of emerging security trends at the SANS Institute provided fives steps to help ensure security with AV equipment. Choose video systems that support encrypted communications between cameras and servers, as well as support for strong authentication for administrative access. Ensure manufacturers have a documented process for providing software updates, and make sure you have a process for rapidly installing the updates; generally, these should be installed in one week or less. Do not directly connect camera systems to the internet or to network segments that are directly connected to the internet. Keep all cameras and servers on an isolated network segment that uses a firewall to provide only the minimum access and that logs all connections.